Does your child breathe through the mouth instead of the nose? Have chronic ear or sinus infections? Poor school performance? Constant lethargy? Rapid shallow breathing? Bedwetting? Hyperactivity? Nighttime restlessness? Dr. Walker’s unique approach to holistic orthodontic care is not to simply give every patient braces or Invisalign. Keep reading to learn why Airway Orthodontics is redefining the field of orthodontics and dentistry! Dr. Walker’s comprehensive approach to your child’s orthodontic treatment does not just consider if or how to straighten your child’s teeth. Instead, he incorporates the latest research about the harmful effects of sleep disorders and airway blockages to analyze your child’s facial structure, nasal passages, sinuses, and jaw development as part of his diagnostic evaluation. Walker Orthodontics recognizes that the most effective orthodontic treatment works in conjunction with treatment for conditions like sleep apnea, snoring, and other airway disorders. In fact, as one of the country’s renowned experts in Airway Orthodontics, he may end up determining that your child won’t even need braces! Walker Orthodontics starts the process by using our in-office diagnostic scanning technology, or iCAT, to construct high-quality 3-D image of your child’s mouth, neck, and throat. This advanced diagnostic equipment reveals any structural issues related to restricted airways or sinus abnormalities. 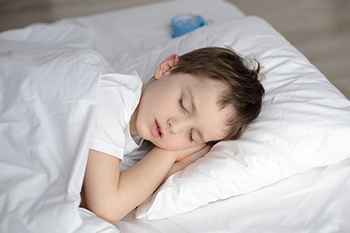 In fact, we often find that the iCAT’s results more accurately pinpoint why your child is not sleeping well, wakes up sleepy, has a constant runny nose or frequent ear infections, or even has trouble in school. Our goal is to accurately and effectively treat your child’s symptoms of obstructive sleep apnea and other breathing disorders – and possibly avoid the need for braces altogether! Parents are often relieved that we are able to use minimally invasive techniques, such as a “pre-braces” appliance, to achieve significant improvements fairly quickly. A Consultation at Walker Orthodontics Can Change Your Child’s Life! Ready to enhance your child’s quality of life? Discover how Walker Orthodontics has helped thousands of patients breathe, sleep, and live better as a result of treatment from Dr. Walker and Dr. Neely. We invite you to get started by scheduling your FREE Walker Orthodontics Smile Assessment by calling 978.345.7988 or clicking here to use our convenient online appointment request form. Your complimentary, no obligation appointment includes a complete oral exam and health history, digital imaging, an office tour, and a consultation with Dr. Walker or Dr. Neely.